Apple’s quest to make its laptops ultra slim and ultra light have led to the company increasingly soldering upgradable parts into the guts of its notebook computers. For instance, with the new MacBook Pro with Touch Bar notebooks, you’ll need to be sure to configure it with the SSD size you most desire out of the gate, because upgrading it yourself just isn’t possible. Case in point: intrepid MacRumors forum member fs454 opened up his new 15-inch MacBook Pro with Touch Bar and found that the SSD chips are now soldered inside. This is a change from previous MacBook Pro models (and even the non-Touch Bar MacBook Pro), in that it is totally non user-replaceable. Image: MacRumors users fs454 You can see that the NAND controller is soldered inside. If you have a Mac Pro or a 27-inch iMac, the installed RAM (and with enough elbow grease, the hard drive as well) is user-accessible, but Apple is increasingly making all of its other devices less and less upgrade or repair friendly. Over the years, it’s been harder and harder to upgrade or self-repair your Apple products. Starting with the MacBook Air back in 2010, Apple started soldering RAM directly into the device. This continued with the MacBook Pro with Retina a few years later. Moreover, user-replaceable batteries were also glued into the casing, and Apple even applied its anti-repair strategy on a more basi level. Custom screws on its iPhones and Macs to make it harder to get inside. This isn’t the first time Apple has soldered an SSD directly into its products, however. The latest MacBook, released in 2015, had its storage chips connected directly to the board, with no user intervention possible. Still, Apple has opted to use a replaceable (though proprietary) SSD memory chip with its non-Touch Bar MacBook Pro. That’s why it’s interesting that the more expensive Touch Bar versions have soldered-on chips. Was this a design decision or is this just another way Apple wants to get more money out of its customers? We’re not sure why Apple is doing this, but it feels like greed. 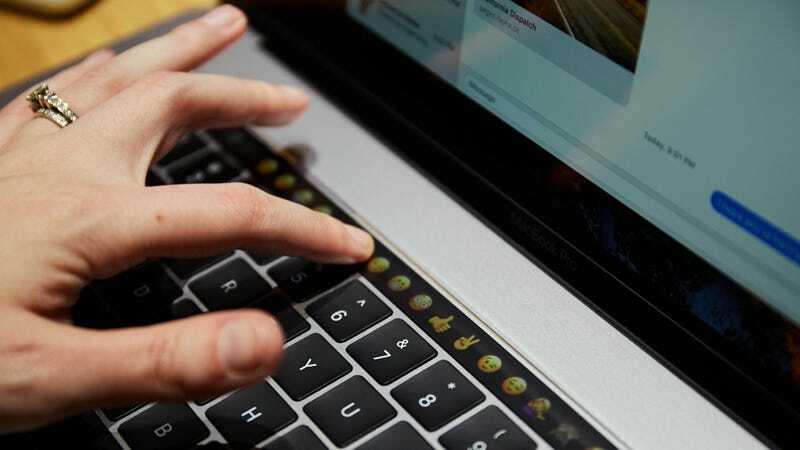 Most modern laptops are not very DIY-friendly anyway, but Apple is often criticized by the repair community for its use of proprietary parts and extensive measures to make user-upgrades all but impossible. The counter-argument is that Apple is selling its computers—particularly its laptops—as appliances. Nevertheless, it’s a little disconcerting to know that the $1,800-$4,200 you spend on a laptop can’t even get an aftermarket SSD upgrade or a third-party repair. We’ve reached out to Apple for comment on the change and will update if we hear back.